Good: Two autographs per pack and thirteen per hobby box, good chance of drawing some big prospect and rookie names. With the late December release date, it's truly a product designed by Santa. Bad: Pricey, sticker autographs, and patches with vague origins. The Bottom Line: It's like Christmas morning. Excitedly, you tear through the 2011 Bowman Sterling Baseball box, enjoying the surprises within, but it's over so soon. Likely, you're somewhat disappointed with the results, but it's all worth it to recapture the excitement of Christmas morning with a baseball product. 2011 Bowman Sterling Baseball is a unique experience. Each hobby box has six packs that are designed to be like mini boxes. They net you a total of 13 autographs (including a numbered dual autograph), and seven relics (including a dual relic box topper). The box-in-box design is good, and, it goes without saying, the amount of hits per box is great. The autos and base cards focus on prospects and rookies, unlike some other Bowman products that contain way too many filler veteran cards. For those who like a little variety, don't be dismayed, Topps threw in a few veterans, like a Strasburg auto (#/25) and various veteran patches. In fact, as a Cardinals fan I was happy to see a dual Pujols/Holliday game-used card. It's something of a letdown that the autographs are on stickers. Sure, you get an insane number of them, but for the price you would think there would be some, if not most, of the autographs being on card. Also, for the price, it is disappointing that the relic swatches are small and of an indeterminate origin. I did not expect to see, “The relic contained in this card does not come from any specific game, event or season" on my patches, but each one had the same disclaimer. I was not completely happy with the card design itself. 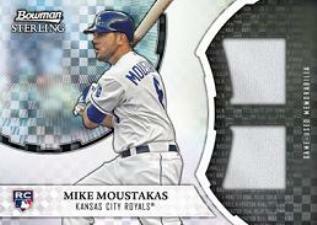 The auto card's dimensions limit the player to a circle or oval that takes up only 60 to 70 percent of the card. Although it is admittedly a matter of preference, I prefer cards that dedicate as much space as possible to the player. 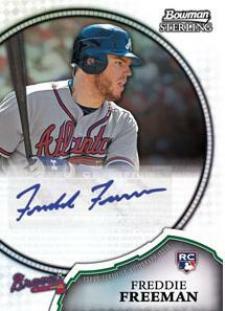 I would not mind it if the autograph surface itself contained larger signatures to balance out a small player picture (like Bowman Platinum), but since these autographs are on stickers, the signature size is minimized as well. At least with the base cards, but, for me, this isn't a product where the base cards get a lot of attention. The checklist has a lot of great prospects and rookies: Mike Trout, Archie Bradley, Bryce Harper, Bubba Starling, Dylan Bundy, Starling Mare, Matt Moore, Mike Pineda, Freddie Freeman, Eric Hosmer and even a guy named Strasburg. And this is just some of them. It's hard to go wrong when you have the chance of pulling these guys. 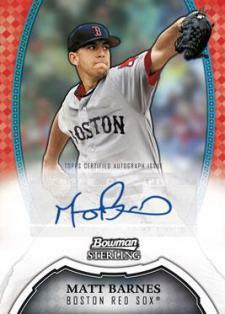 And with 13 autographs in a box, odds are pretty good you'll get at least one in a 2011 Bowman Sterling Baseball box. If there is a complaint about the checklist it is that it is too large, and you are assured of pulling some, if not several, duds. 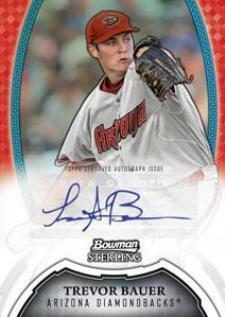 2011 Bowman Sterling Baseball is pricey, but there's a good chance you'll be satisfied either with your pulls or with the experience of pulling autograph after autograph and (nonspecific) relic after (nonspecific) relic. If you don't get the big hits, it looks like the majority of autographs are topping out below $5 a pop on eBay, so there is a chance of you could get a complete dud of a box. Therefore, if you calculate what your pulls are worth on eBay versus what you paid per box, you'll likely be disappointed. But remember, the true joy of this product is not just the value, but the experience of pulling a ridiculous number of hits and being later forced to follow more baseball. It's like Christmas. I think I tore through the hobby box in under five minutes, but it was a great five minutes. I really enjoy products that broaden my enjoyment of baseball. 2011 Topps USA Baseball was one. 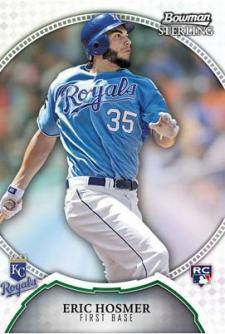 2011 Bowman Sterling Baseball accomplishes this as well. Because I only pulled one big-name autograph (Pineda) and one other auto I was hoping for (Aaron Crow), I was initially disappointed. But after going back and researching more on the other pulls, I realized this product would get me to follow at least a couple more prospects, if not a few more teams. Any product that forces you to watch or pay attention to more baseball is not bad. Also, it's hard to be too disappointed with the eleven other prospects that may do something in the future. 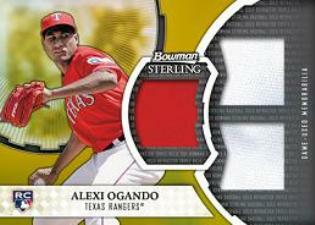 See some of the top cards in the product with our 2011 Bowman Sterling Baseball hit tracker. 50-card base set consisting entirely of rookies. Although technically inserts, MLB Future Stars prospect cards carry the same design and format. Base set and Future Stars parallels: Refractor (/199), Gold Refractors (/50), Black Refractors (/25), Purple Refractors (/10), Printing Plates, Red Refractors (/1), Canary Diamond (/1). A total of 13 Rookie Autographs and Future Stars Autographs per box. Parallels: Refractor (/199), Gold Refractors (/50), Black Refractors (/25), Purple Refractors (/10), Printing Plates, Red Refractors (/1), Canary Diamond (/1). Each box will also have a Dual Autographed Card with members of the Team USA 2011 Collegiate National and 18U National Teams. Signatures will be on clear stickers and each is numbered to 299. Parallels: Refractor (/99), Gold Refractors (/50), Black Refractors (/25), Purple Refractors (/10), Red Refractors (/1), Canary Diamond (/1). Team USA Relic Cards and Rookie Relic Cards have game-used memorabilia and fall one per pack. Parallels: X-Fractors Dual Relics (/199), Gold Refractor Triple Relics (/50), Black Refractor Autographed Relics (/25), Purple Refractor Patch Autographs (/10), Red Refractor Patch Autographs (/1). Dual Relic Box Toppers are numbered to 299. Parallels: Refractor (/99), Gold Refractors (/50), Black Refractors (/25), Purple Refractors (/10), Red Refractors (/1). 2011 Bowman Sterling Baseball Factory Sealed Hobby Box TROUT RC AUTO? 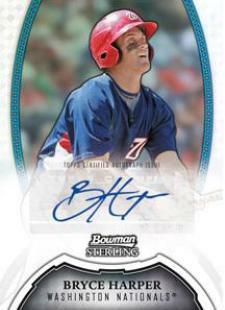 2011 Bowman Sterling Baseball is one of the marquee products for Topps every year. It’s one of, if not the most expensive product they put out on a yearly basis and it’s always a hit. Good: Lots of value in the product. Great class of rookies and prospects, a nice clean design, lots of autographs and jerseys, collectible refractors that people love. 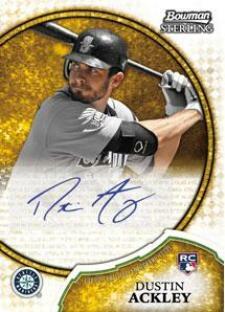 Bad: Sticker autographs on such a high-end product is a letdown, and the inclusion of USA cards are overkill. 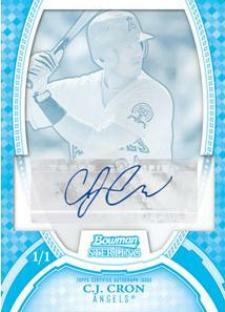 The Bottom Line: 2011 Bowman Sterling is a high-end Topps product that costs around $220 per box. You are guaranteed 20 hits per box including one dual autograph, 12 autograph card, and 7 relic cards. Each box also boasts a ton of rookie cards. Card Design 3.5/5.0: A clean design with white borders. Fairly common for the Bowman Sterling set, but it comes off very well. I think in future sets it could be improved by having a larger photo of the players and not so much empty space. Checklist 5.0/5.0: The checklist ended up with a great class of rookies and prospects. Lots of 2011 first round picks that include players like Bubba Starling, Bryce Harper and Fransico Lindor, as well as great rookies such as Eric Hosmer. Top to bottom the checklist is stacked with talent and value. 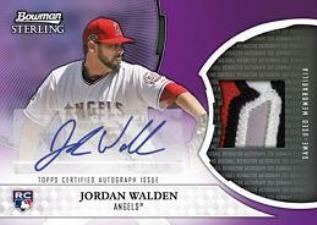 Value 5.0/5.0: With 20 hits per box and over half of those being Autographs there is a ton of value in 2011 Bowman Sterling. Add in the fact that you can hit rare refractor parallels as well and the value gets even better. The Fun Factor 5.0/5.0: Between so many hits and the thrill to pull a great card 2011 Bowman Sterling is very fun to open. You have a mix of veteran, rookies and prospects all in one product so there is a card in this product for everybody.